Wheel Storage and Transport cage enabling storage of aircraft nose and main tires. Fits wheels from 87cm / 35" up to 120 cm / 47", 43 cm / 17" wide. The Foreign Object Debris (FOD) kit, top plate, and divider kit make it perfect for aircraft hangar storage and compatible with FOD requirements. Secure wheels in storage and transport to prevent damage to wheels and ensure safety of personnel. The cage adapts to wheel size and accommodates most military wheel sizes. Comply with vertical storage requirement for pneumatic wheels, according to the Joint Service Manual. Self-centering corners to ensure safety and efficiency in stacking. 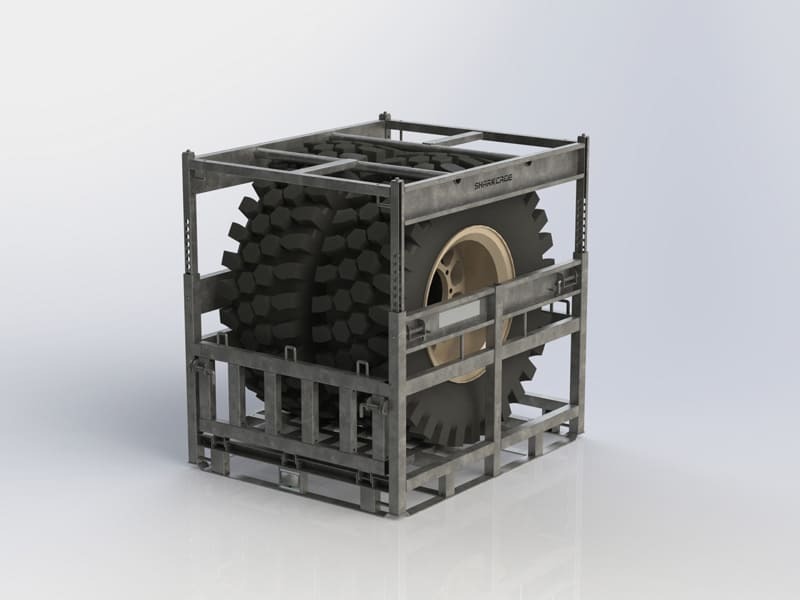 Wheel Storage and Transport cage enabling storage of larger and heavier wheels.